This great new poster provides a comprehensive overview of the subject by presenting the important breeds in historical context. The horse evolved in North America during prehistoric times. Around 20,000-30,000 years ago, it crossed the land bridge into Asia and its descendants migrated into Europe. The horse became extinct in North America about 11,000 years ago. Columbus reintroduced the horse to the New World on his second voyage in 1493, when he brought them to Cuba. In 1516, Cortez landed a small herd on continental North America. The Spanish later brought many others. During the next century, the English carried them to Virginia and New England and the French transported them to Canada and Louisiana. Later, the Germans, Dutch, Swedes and Finns brought their distinctive breeds into New York, Delaware, Connecticut and Pennsylvania. These colonial imports make up the first section of the poster as they provided the bloodlines for the many breeds that followed. Several very important but now-extinct breeds are included. The next section shows the feral and Native American horses. The term �wild� refers to an animal that has never been domesticated. �Feral� refers to domesticated animals that have returned to the wild. All North American feral horses are called �mustangs,� but there are several very important breeds. The last section shows the many other breeds that originated in North America. The importance of the horse to our nation is conveyed through illustrations showing ways they have been used by conquistadors, patriots, the U.S. Army cavalry, cowboys, modern-day police and others. 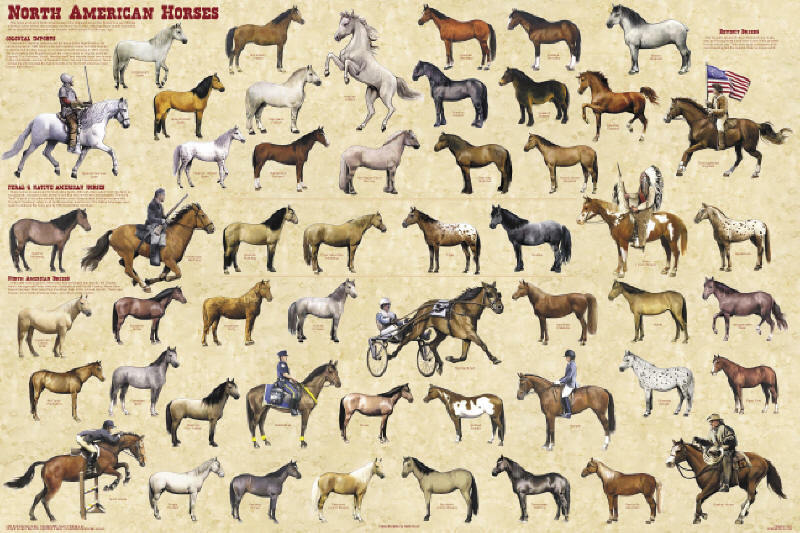 Fifty-four magnificent breeds are faithfully and accurately illustrated, making this poster an essential reference for horse lovers.